The strength of the department is based on its excellence in teaching, research and innovation. Recently our teaching excellence has been acknowledged by two prestigious awards to Drs. Brubaker and Cox for their exceptional contributions to graduate teaching, supervision and innovative teaching (full details below). Outstanding work! Congratulations to Dr. Patricia Brubaker on being awarded a 2015-16 Faculty of Medicine Graduate Teaching Award for Sustained Excellence in Graduate Teaching and Mentorship. Pat will receive the award at Faculty of Medicine Education Achievement Celebration on May 11, 2016. Congratulations to Dr. Brian Cox on being awarded a 2015-16 Faculty of Medicine Graduate Teaching Award for Early Career Excellence in Graduate Teaching and Mentorship. 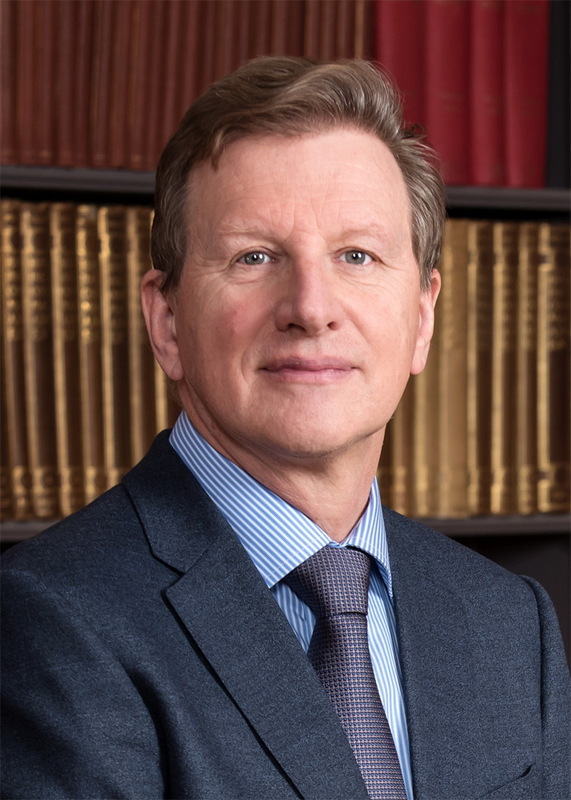 Brian will receive the award at Faculty of Medicine Education Achievement Celebration on May 11, 2016. Title: "Serotonergic modulation of the prefrontal cortex during retrieval of recognition memory in rats." 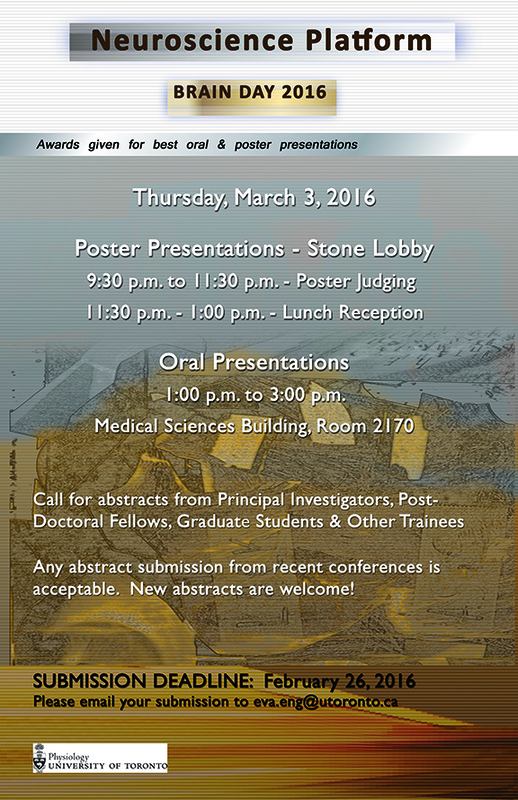 The Neuroscience Platform of the Department of Physiology is delighted to present BRAIN DAY 2016 on Thursday March 3rd, 2016. Abstract submission Deadline: February 26th to eva.eng@utoronto.ca Please see poster below for all the details. The University of Toronto Physiology Department is staging an exciting scientific symposium to celebrate the 10th anniversary of CAN meeting on May 28 (1-5 PM) & 29 (9AM-1PM), 2016 in the MacLeod Auditorium and Naylor Lobby (former Stone Lobby) of the Medical Science Building on campus, which is officially a satellite meeting (http://can-acn.org/university-of-toronto-physiology-department-can-satellite-may-28-29). This symposium will bring together outstanding faculty and trainees associated with the Dept currently or in the past to highlight glorious accomplishments in the past 25 years and prospective outlooks of the future; to honor several senior neuroscientists who have made tremendous contributions to the field and commemorate the late John F. MacDonald and Hubert van Tol; and most importantly, to discuss emerging horizons of new areas, ranging from fundamental mechanisms of synaptic transmission, plasticity and behavior to stem cells therapy and translational medicine to treat stroke, pain and other neurological and neuropsychiatric disorders. Please see link for registration details. We sincerely invite CAN delegates to join us for a science party in Toronto just one day before the CAN meeting officially starts.